This page offers information on ways of working and fees. Working by telephone or online, we can potentially work together wherever you’re based. From weekly sessions to fortnightly, monthly, breakthrough sessions, brief therapy (also known as Single Session Therapy) and my online programme. If you’re local enough to (or visiting) Westport, Co Mayo, Ireland, you can book face to face therapy, supervision or self-care coaching with me when I get there (dates to be confirmed). 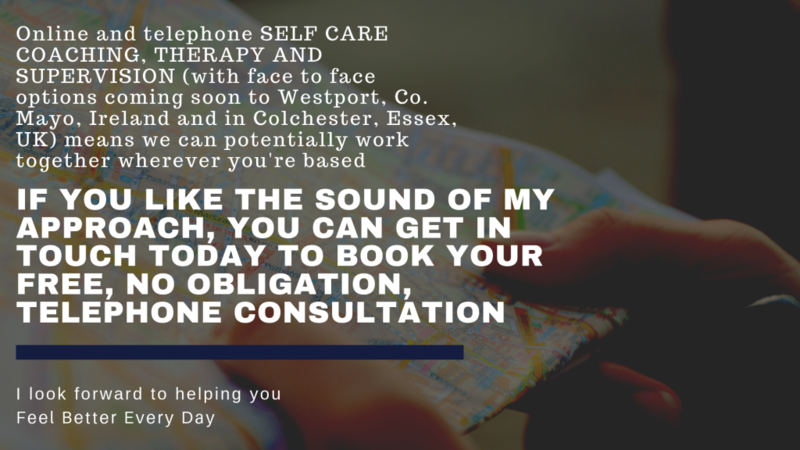 In the meantime, you can book face to face counselling, Single Session Therapy, supervision and self-care coaching with me in Colchester, Essex. Colchester is within easy reach of Witham, Kelvedon, Marks Tey, Feering, Brightlingsea and Chelmsford. This free initial telephone consultation usually takes less than 20 minutes and will give you a chance to see how comfortable you feel talking to me. It gives me a sense of whether or not I think I can support you at this time. After this, we’ll usually agree to meet for an initial 60 minute session (for everything apart from integrative clinical supervision which is more likely to be 90 minutes and Single Session Therapy and Breakthrough Coaching Sessions which are at least 2 hours). After that, for ongoing work, we can continue in an open-ended (for as long as it’s useful for you) way. For some people, this means a couple of months, for others several months or even years. I’m qualified and experienced in a wide range of therapies. As well as being a registered and accredited BACP (British Association for Counselling and Psychotherapy) and IACP (Irish Association for Counselling and Psychotherapy) psychosynthesis counsellor, I’m an integrative clinical supervisor, integrative coach-therapist (sometimes known as therapeutic coach or Personal Consultant), yoga therapist and instructor, life coach, NLP Master Practitioner, certified and accredited Advanced EFT Practitioner and a crystal therapist. While my approach is collaborative – offering you options regarding the direction you want our work together to take – my holistic, integrative approach means that while I’ve been working with some clients for years, you’ll (assuming you’re motivated – if not, we can work with that, too) see results quickly. You can get a sense of what it’s like to work with me for 6 online sessions from this cover story in Psychologies magazine (December 2018) – READ MORE… Long term work can be wonderful for deeper, sustainable transformation but it isn’t possible for everyone. My flexible approach means that even if you just want one or a few sessions, you’ll benefit. Then it’s a matter of grounding and building on these improvements so progress continues long after our work together comes to an end. The self-care focus means that from the very start, you’re learning how to better support yourself. Sliding scale – if I have availability, I may be able to offer reduced rates at certain times. 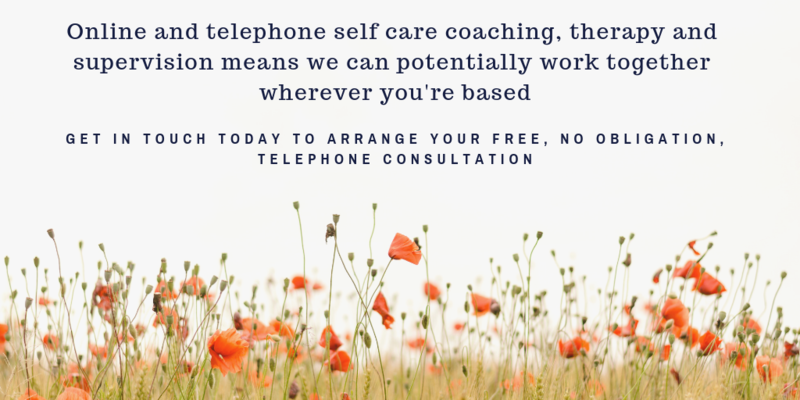 If you need this, please email me – eve@selfcarecoaching.net – saying a) what you want support with b) why my approach appeals c) how much (ideally) you’d like to pay per 60 minute hour and why and d) when you’d (ideally) like sessions (usually at the same time each week). Already booked your session/s? Please confirm your booking by paying (by bank transfer using the information I’ve given you or using the relevant PayPal link below).